← Do you own a chainsaw? Stay sharp! 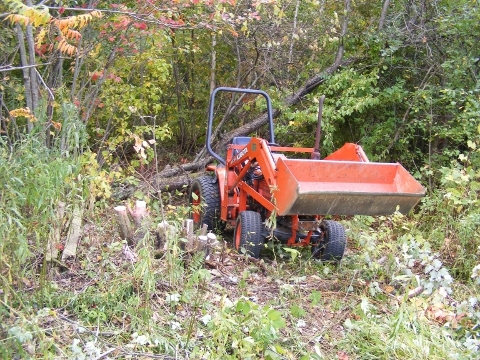 Kubota B1750 Set Up to Skid Logs. 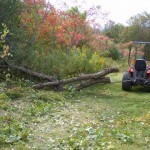 Shortly after I got comfortable with my chainsaw, I realized that if I was going to make any kind of headway cutting my own firewood and maintaining my woodlot, I’d need a way to get heavy logs out of the forest. I got set up to do this for about $100. More logging chains and log tongs are handy to have, but the items above are the essentials. If you go this route, you’re out $103.97 plus tax. 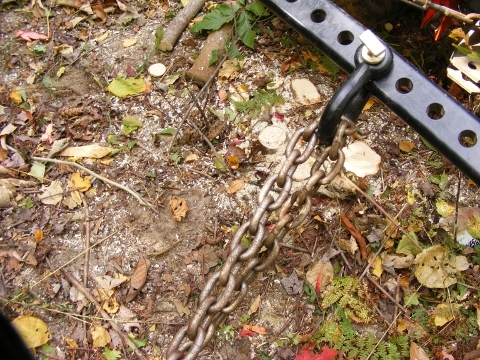 Logging Chain – Make sure to buy a chain that is rated for the weight your tractor can pull. 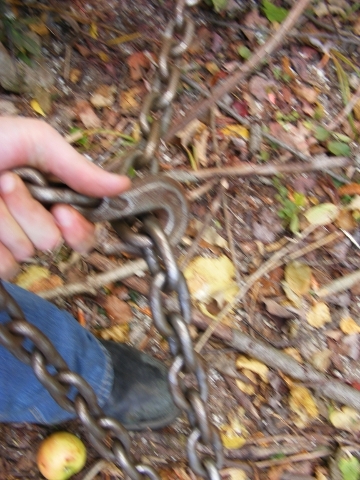 A typical logging chain has a different type of hook at each end. One end is a slip hook, and the other is a grab hook. Pretty self explanatory, but in case you need some enlightenment, you put the slip hook around the log(s) you’re moving so the loop slips shut on your cargo. 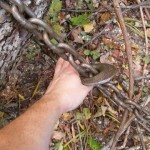 You use the grab hook to take out the excess slack in the chain. The narrow throat of this hook lets it lock against the links of the chain. 3 Point Hitch Cross Drawbar – Attach this to the lift arms of your 3 Point Hitch. With this type of drawbar, it’s possible to lift the front of the log off the ground while skidding. This will let you haul larger/more logs since the front isn’t digging into the ground. That said, while you’re skidding logs you should set the height limit of your controls so that the hitch never gets above your rear axle. If you lift something with the hitch above the axle, you risk flipping your tractor over backwards. Heavy Duty Clevis – You mount this clevis in any of the holes on the drawbar. 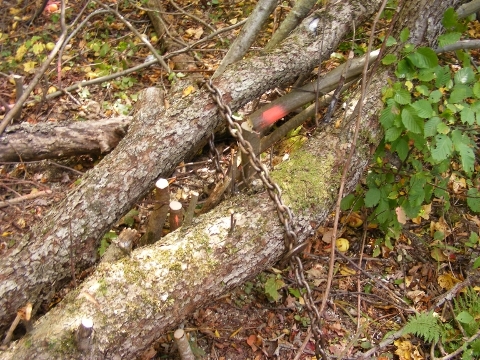 This provides a strong, stable connection point to loop the logging chain through. Get this as close as possible to the log you’re skidding. 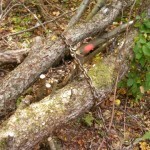 Securing the log with a slip hook. Loop the slip end of your logging chain around the log you need to move. I go over then under, letting the weight of the chain keep the hook secured. At this point, I also remove any slack in the loop that passes around the log. Pull the slack out of the chain around the logs. Make sure the slip loop is tight around your cargo, and that the hook is secure. Pull the chain tight on this end as well. Back your tractor up to the log as close as possible. 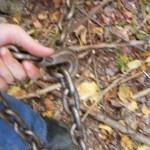 Pass the grab hook of your log chain through the clevis. Pull all of the slack through the clevis. 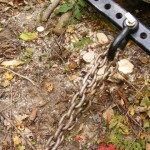 Attach the grab hook to the chain links so that there is minimal slack in the chain between the log and the tractor. Double check the slip hook and the grab hook before pulling. Skid those logs out of there! With the chains secured and the area clear, you can skid the logs out of the woods. Try to travel in straight lines as much as possible. If you have to turn, make it wide. 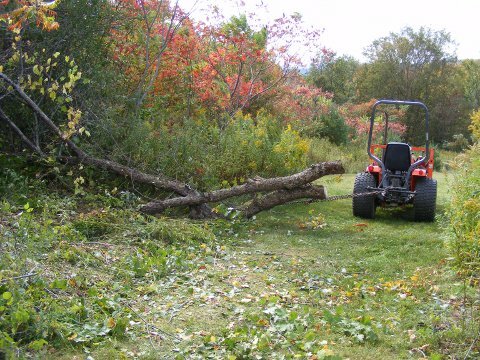 Since the log has no way of tracking other than the tractor pulling it, you should be very careful skidding logs near buildings, trees, or anything you don’t want to crush with 1100lbs. of wood. Wear steel toe boots whenever logging, skidding, or operating your tractor. 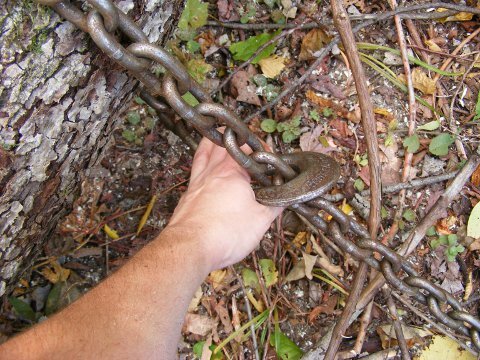 Wear gloves when handling chains or logs. Make sure the area is clear. Try to get the front end of the log off the ground. Know the limits of your equipment. Skid logs over surfaces you want to keep clean/nice. Pull ANYTHING attached to the back of your tractor above the rear axle! Let your friends ride on the log while you skid it. Take sharp turns near display cases of priceless artifacts. Or your woodshed. Hope you all enjoyed reading this! See you next time! This entry was posted in Tools/Equipment and tagged B1750, firewood, Forestry, Kubota, Logging, Tractor. Bookmark the permalink.